Tag line: "Where did the universe come from? Will time ever come to an end? Which came first, the chicken or the egg?" From the night it premiered in September of 1987, I have been a big fan of Star Trek: The Next Generation, and one of my all-time favorite scenes in the entire series is the opening of The Descent, part 1, an episode that aired during the show’s 6th season. In it, the android Data, played by Brent Spiner, is in the holodeck playing poker with three of history’s most impressive scientific minds: Isaac Newton (John Neville), Albert Einstein (Jim Norton), and Stephen Hawking (appearing as himself). Hawking was a fan of the series, and this brief bit of whimsy allotted him a chance to finally appear in an episode, but the more I learned about the man, the more I realized he belonged in this class of great thinkers, and his work in the field of cosmology has allowed us to understand our universe in ways that were not possible before. 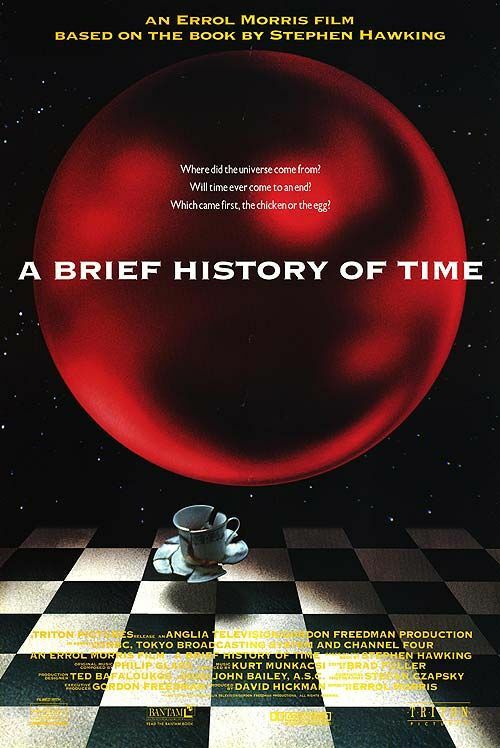 Director Errol Morris’s A Brief History of Time is both a biopic about Stephen Hawking and a documentary that presents, sometimes in amazing detail, the theories he developed over the years. Born in England during World War II, Hawking was, according to his mother (interviewed here), an active child, and usually impressed the adults around him with his sharp mind and analytical skills. It was during his years at Oxford and Cambridge that he dedicated his life to researching the universe, and it was also at this time he was diagnosed with ALS, a neurological disease that would eventually render his body useless. Told in the early 1960s that he only had about 2 years to live, Hawking beat the odds and, to this day, continues to astound with his theories on such topics as black holes and dark matter. It’s here that the movie truly excels, with Morris giving us computer graphics, testimony from Hawking’s former classmates and peers, and even a few clips from Disney’s The Black Hole, to explain how his findings have taken the field of cosmology to new heights. I’ve watched A Brief History of Time twice now, and while I can’t say I’m any closer to fully comprehending his research into black holes and the Big Bang, Hawking himself (rendered mute by his disease and speaking by way of a specialized computer program) is as witty as he is brilliant, and does his best to present these very involved subjects in a manner that everyone can understand. There are other works out there that delve deeper into Hawking’s research (the 1997 TV miniseries Stephen Hawking’s Universe is quite fascinating), and 2014’s The Theory of Everything, in which Eddie Redmayne plays Hawking, gives us a broader understanding of his life, both personal and professional. But as a concise, entertaining look at both the man and his discoveries, A Brief History of Time is, indeed, an invaluable resource.